We play acoustic guitars and sing. During the daytime, this can be 'unplugged', which means we are not restricted to one area and can play without electric. But for the evening party, we will amplify our music, this has a live band sound. 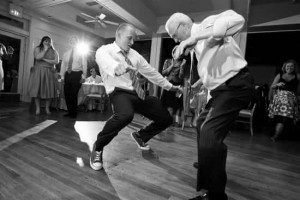 We have an emphasis on upbeat and energetic live songs... perfect for getting all the guests on the dance floor! We pride ourselves in being diverse with our live sets. 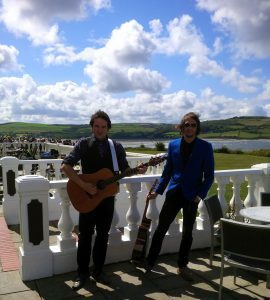 We can play during the ceremony, drinks reception and evening reception. 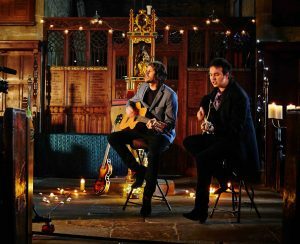 Light and up-beat vocal and acoustic guitars work great to set the tone for the day, during the drinks reception. A perfect sunset? 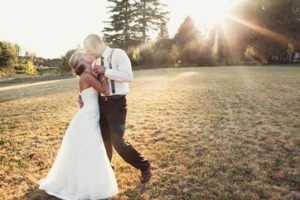 We can offer to play your first dance outside! We know which songs work best for which part of the day, and we always make sure we really ramp it up for the evening reception! We like to keep the set energetic and up-beat. The guitars and vocals are amplified though our PA system and we provide stage and dance floor lighting to add to the atmosphere. The evening reception in full swing!